Although the Ivybridge route is not that much of surprise it is interesting to see it running every 30 mins AND a Sunday service too! At the moment Ivybridge is served by First with the hourly X80 and the occasional 180 which seems to fill in a few gaps more than anything else. The town is also served by Stagecoach X38 every two hours. It will also be interesting to see what the fares will be on this service. I guess the standard £2 flat fare wont apply after Plympton, but expect it to be ‘competitive’ with First and Stagecoach. "There's a tunnel that leads from Drake's Island to The Hoe" Hidden Plymouth NEW BLOG! This will be Plymouth Citybus's first incursion into Ivybridge for some 20 years or so. For a short while in the late 1980s maybe into the early 1990s they ran the 88A from the City Centre through Plympton and Lee Mill to Ivybridge and the old Moorhaven Hospital at Bittaford. This new route looks like it will be the quickest from Ivybridge to the City Centre as Lee Mill looks not to be served. Ivybridge Rail Station as the terminus for the route seems odd though as there are hardly any trains there. I'm surprised they haven't looked to serve Cornwood Road and Langham Levels and the block of housing to the west of the town then terminating at the top of Cole Lane like First's old 88. If PCB have the same fares as the rest of their network and include the town in the Outer Zone then I think First will be in trouble here. I wonder if we will see some additional short working X80s to match the frequency of the new 45? Or will the 180 be increased to hourly? Cant see Citybus trying to take on Firsts' 15 minute frequency to Tavistock. Come on First you have to retaliate now.... a rival service to Tamerton Foliot perhaps would be good as Citybus service here is not that frequent!!! ^ Can't see an increased frequency for Tamerton Foliot; yes it's every 30 minutes and it takes near enough an hour to get into town, but then you get an evening service, a Sunday service every 30 minutes, and a Sunday evening service! If Citybus really want to compete with First in Ivybridge then maybe have every other journey from Ivybridge run through Plympton to compete with the 180 and run through Plympton on Sundays? Surely there's a market for that seeing as the 180 doesn't run on Sundays. Thing is though Citybus for some years now have been keen on keeping timetables simple, so unless this was given a different route number I don't think they'd be that likely to do it. Great news - it's about time Ivybridge had a proper bus service. Public transport to a town that's larger than Tavistock and nearly twice the size of Totnes is quite frankly a disgrace. 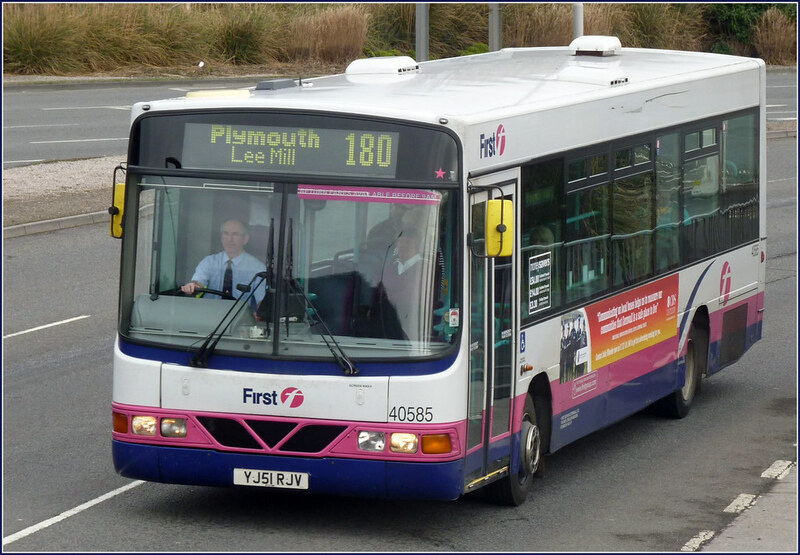 Hopefully there will be a late bus from Plymouth too (currently the last 180 is at 17:50 and the last X80 is at 19:35). If First can't compete then they only have themselves to blame - all they've managed to offer is a very poor service with clapped out vehicles on the 180 and the X80 (with admittedly better vehicles) often runs late. Well I just think First have got to retaliate with saomething they can't just let Citybus muscle in on their routes. I believe they should beef up their services along the Derriford - Mutley - City corridor and maybe a rival 16 service as Citybus struggle on reliability here!! Thing is it could backfire bn Citybus if they push First out.. the likelihood is they would sell to Stagecoach who are very aggresive in competition and I am sure would compete more on the Plymouth routes than Firsts recent attepts! Last bus from Plymouth 7.10 Mon - Sat. 5.10 Sundays. See Citybus website!! Don't know where you folks live but I have nothing but praise for Citybus. The First service in Saltash is a disgrace, the fairs are over the top, the buses never turn up. Citybus, however - you can set your clock by the 43A that it'll turn up on time and the drivers are always friendly.